Retro Dance covers a broad range of blues based styles developed during the 1930's to 1950's. These dance styles share similar patterns of movement, composition, and core dance content but vary with respect to their characterisation, emphasis and structure to provide clearly related but distinct dances. In accordance with the shifting trends of the blues music scene, the different dances evolved to match - often with regional variations in style and/or action that remain evident today. Consequently, there are many forms of Swing, Blues, Rock 'n' Roll, and Rockabilly dancing and no particular form(s) should be considered fundamentally 'correct'. Unlike the dances developed in the ballroom studios of the day, the 'retro' dance styles evolved on the streets from a mixture of different influences. Actions were rarely defined and dancers were respected for their ability to innovate and improvise. In addition, with the dispersion of US culture following WWII, different places about the world acquired and retained different - but all genuine - aspects of that culture and the dance styles it generated. Recognising the diversity of Retro Dance, Cool Cats aims to provide students with a solid foundation in the major dance styles from which less common variants and specific stylings have derived. In this regard each dance style is taught to remain true to its fundamental form while acknowledging that, with continued dance development and understanding, improved methods and techniques may exist than those originally adopted. Similarly, whether due to injury, prior training, or learning difficulties, our approach can remain flexible to meet the needs of different students while achieving the dance outcomes desired. Perhaps with time and collaboration by dance teachers across the globe a unified codex for 1930s-1950s dance styles will be developed; but the dance itself will continue to change and develop as new music, trends, and (hopefully) better ways of dancing are discovered. The roots of ('classic' and contemporary) rock 'n' roll music may be traced back to 1920-30's blues, jazz, and swing through the development of 'rhythm and blues' during the period between 1940 and 1960. The term 'rhythm and blues' was loosely employed to characterise a wide variety of styles based on traditional ('white') pop music structure and influenced by ('black') blues vocals, rhythms, and styling. This musical combination was more flexible, energetic, and entertaining - perfect to encourage the development of fun, new, and exciting dance styles. The emergence of rhythm and blues also had strong influence on the country music of the southern United States. The combination of early rock 'n' roll and 'hillbilly' music, in conjunction with significant contributions from western swing and boogie woogie, came to be known as Rockabilly. In a similar fashion to the music, Rockabilly dancing developed from the integration of early rock 'n' roll and country dance styles. Early Rockabilly mixed a variety of musical genres and forms, including jazz, folk, honky-tonk, and bluegrass. This depth and fusion of primarily blues-based styles remains reflected in diversity of Rockabilly music today. The following summary provides a rough chronology of the evolution of 'nostalgia' music and dance styles. However, it should be recognized that the styles we now identify were not so clearly defined during their development. To some extent all of these styles overlap - and continue to do so today. 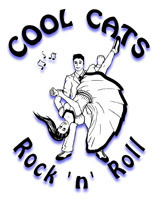 Cool Cats structured courses in Swing/Lindy-Hop, Kick-Step Rock 'n' Roll, Rockabilly, and 4Beat Blues cover the broad range of dance structures, footwork, and base rhythms applicable to Retro Dance. These courses therefore provide a great introduction to dancing and a clear pathway for dance progression and development. Meanwhile, general classes and short courses offer the opportunity for students to examine a wide variety of further styles/skills such as Jive, Continental Rock 'n' Roll, and Triples. In addition to lessons, part of the fun of Retro Dance for many people is embracing the culture and community - be it Blues, Swing, Rock 'n' Roll, or Rockabilly. Although you may rarely see us dressed 'in gear' or at non-dance events, rest assured that each Cool Cats instructor has their favorite style(s) and we love to see people get involved. We encourage all students to try different dances and to participate in the social scene to find the style(s) they love! We wish we had enough time in the week to dedicate a course to every dance style we teach. However, Cool Cats general classes provide the opportunity for dancers to work on other basic dance styles such as Pressure/Tap-Step Rock 'n' Roll or Jive and more exotic or advanced forms such as Continental Jive/Rock 'n' Roll or Double Speed/Triples Rockabilly. Our variety of short courses and workshops also examine specific elements of dancing such as timing, lead/follow, footwork, and body movement. Some of these classes do not require a partner and work through instructional line dances such as The Jitterbug Stroll.